This year most of my fruit trees were frozen in a late frost, however the one tree that did avoid the worst of the cold weather has managed to produce a bumper crop. We have two plum trees in the yard, one of which is a beautiful, but very overgrown, mother. The other is a daughter offshoot that hides in the shade of our yard and generally gets overlooked. In fact, I wasn’t even aware of the fact that it was carrying fruit until about a month ago when I looked closely and realized the branches were laden with small, purple globes. Since we purchased the house with established fruit trees, I am not sure what type of plum these are, however as they’ve ripened they have developed a lovely sweet-tart flavor and have a rather eerie green flesh. Yesterday we processed about ten cups in order to make what turned out to be nearly a gallon of preserves and we only used a third of the plums! I honestly have no idea what we are going to do with the rest, but I am hoping to find some recipes for plum cakes, puddings, pies, tarts…you get the idea! Suffice it to say the bounty is pretty impressive and I am hopeful that as our fruit trees mature and we learn more about taking care of them we can avoid a frost kill like the one that happened this year and actually be able to harvest some apples, pears and apricots from the other trees in our mini-orchard. Until then, however, any and all plum recipes are appreciated and I will definitely share my plum experiments as they occur! Happy Eating! I love spring. 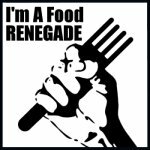 Not only are the birds singing, the flowers blooming and the sun shining, but foods much missed over the winter are making a comeback. 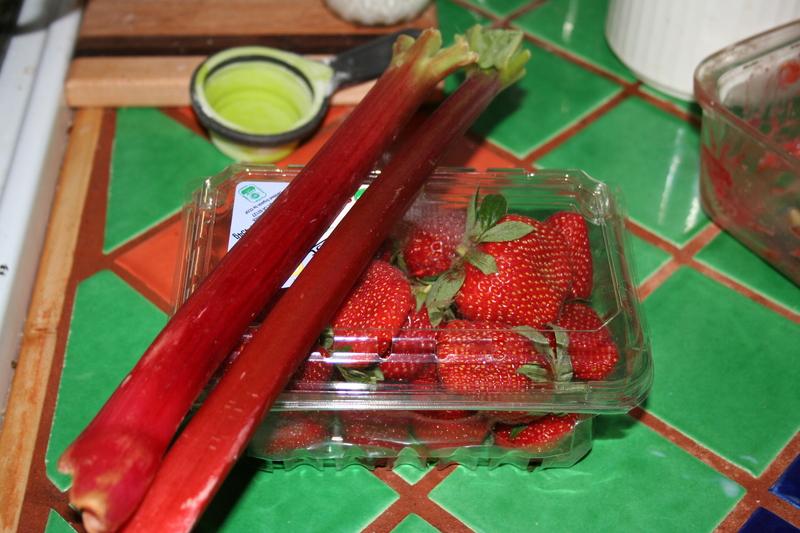 And the very best thing, in my mind, is the reappearance of strawberries and rhubarb – one of my favorite combos. So this evening I decided to make an easy dessert. A simple crumble that has just enough good things in it to make it seem nearly like health food. I like to cook my rhubarb and strawberries before making something like this. The primary reason is to avoid over sweetening, or worse under sweetening, your filling. If you cook them together with the sugar on the stove top first, just until they soften, you can gauge whether or not you need to add more sugar before the final baking. Once this has been done, go ahead and mix up your crumble topping. Place the flour, sugar, salt, oats and wheat germ in a bowl and whisk until well mixed. Using a pastry blender, add the butter and mix until you get a coarse crumb. 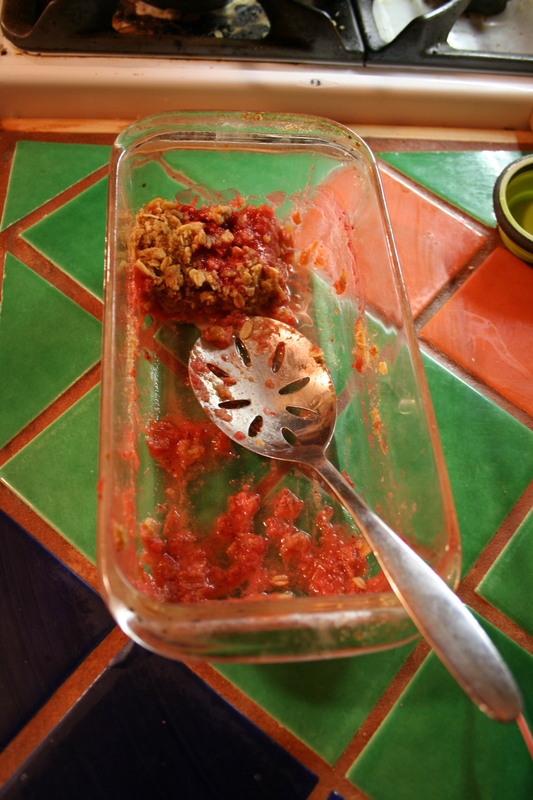 Pour the strawberry and rhubarb mixture into an 8×4 bread pan and cover with the crumble topping. Bake at 350 degrees until the filling bubbles and the topping mixture just begins to brown. Serve warm with vanilla ice cream and enjoy! This years holiday season is upon us (boy is that an understatement) and I am so far behind on baking that I am almost ready to throw my hands up in the air and force people to make themselves sandwiches for dinner until 2010. It hasn’t helped that I was horribly ill over the weekend, meaning that the two days I was to spend making biscotti and minced beef suet were instead spent in bed or on the couch under copious blankets, desperately trying to keep my, also sick, two year old entertained without actually expending any energy. I am sufficiently recovered at this point to get moving on this holiday thing, however, and while I am still hovering alarmingly close to the box of tissue in the dining room, I suspect that by tomorrow things will be in full swing. A batch of shortbread has already been made and consumed and I am moving on to the rest of my list. Most importantly will be the plum pudding attempt. Traditional Christmas puddings (and by traditional I mean British) don’t actually have any plums in them. They are in fact mostly raisins and beef fat. I have been looking forward to trying beef suet ever since my first successful use of home rendered lard. The only thing I have been lacking was a good recipe in which to use it. But no longer! I took the recipe right out of the Joy, modifying it only slightly, and was met with great success. A full days worth of effort went into the production, but the results were more than worth it. Additionally, thanks to a large quantity of spirits, all leftovers will leave over until well into the new year. The process for making a steamed pudding is more time consuming than labor intensive and while a pudding mold does make the end result quite pretty, it is not necessary. A glass bowl will do just as well as long as you have aluminum foil with which to cover it. You will also need a large pot with a rack in order to steam the pudding. I used my pressure canner and it performed fabulously. Begin by chopping coarsely 1/2 of the raisins. 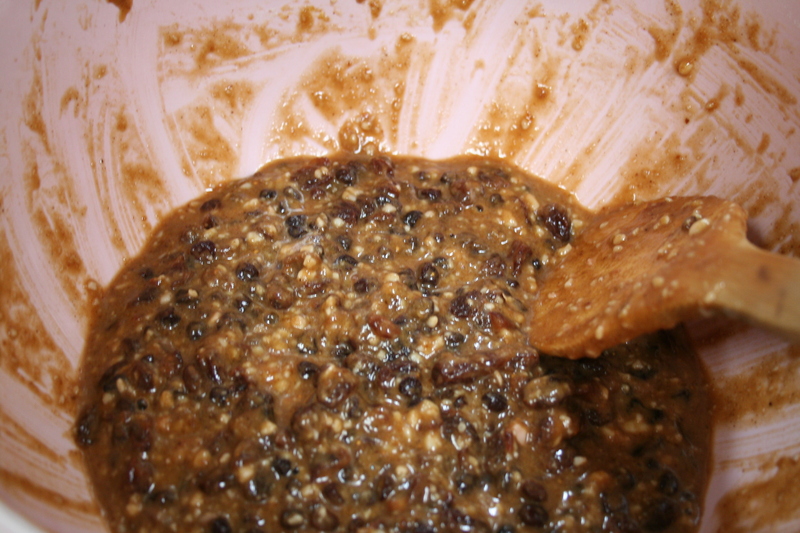 Combine the remainder of the raisins, the currants and figs with 2 c water. 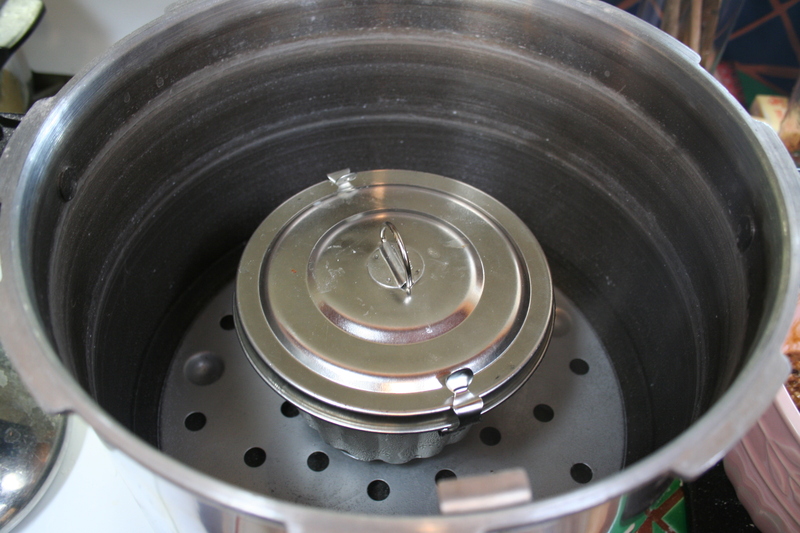 Simmer, covered, for 20 minutes then uncover and let simmer until the remainder of the water boils away. Set aside and let cool until room temp – about 2 hours. While you are waiting for the fruit mixture to cool, you can work on your beef suet. 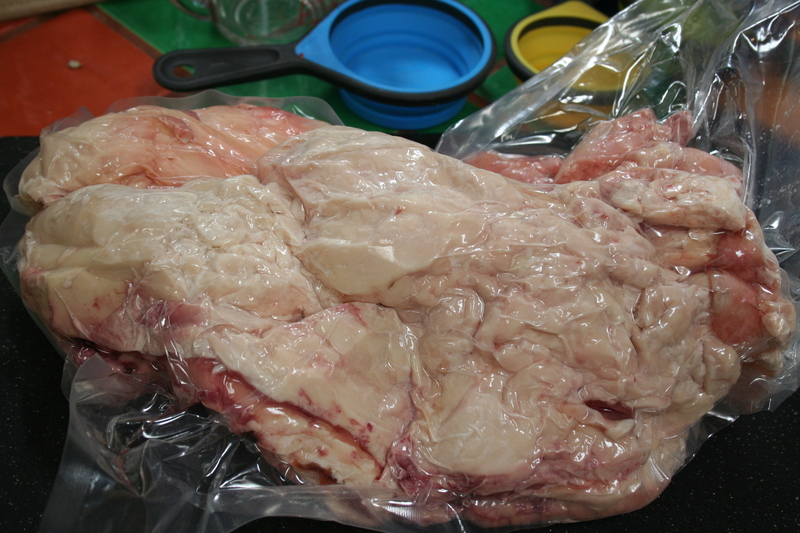 Beef fat is unlike leaf lard (pig fat) in that it has parchment like layers which need to be removed. The easiest way to do this is to freeze the suet prior to working with it and prepare it while it is still cold. The fat will simply crumble in your hands, having a very wax like consistency, and you can pull the parchment-like sections away. Once you have culled the fat thusly, simply use your best chef’s knife to mince it until it looks a bit like sand. 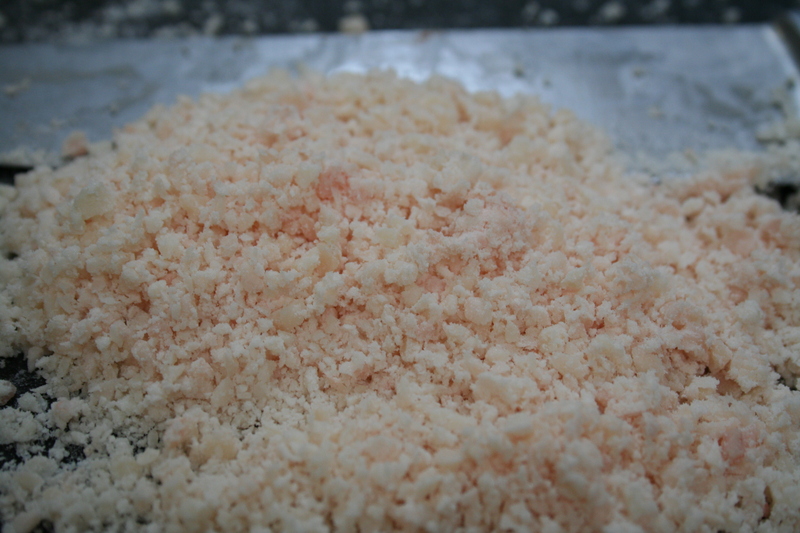 Combine the flour and minced beef suet in a bowl, rubbing it together with your hands until the fat particles are just separated. Add the sugar and spices and mix until just blended. In a separate bowl whisk the eggs and the spirits, then add this to the flour mixture. Stir in the cooled fruit and pour the batter into a well greased mold. I used lard to grease the pudding mold, and I used a generous quantity at that. Leave at least 1 inch of headspace for the pudding to expand. Place the pudding in your canner (or other pot) and pour boiling water into it so it comes about 2/3 of the way up the side of your mold or bowl. For a 1 qt pudding, steam 4 to 5 hours. The above recipe makes two 1 quart desserts. Garnish with some hard sauce (a concoction of butter, liquor and sugar) and enjoy. It should be noted this dessert is incredibly rich so proceed with caution. Happy Holidays and enjoy 2010! While thinking up things to serve at my thanksgiving open house, I decided that mini mushroom tarts would be a fabulous savory option for my guests. Using a standard pie crust, two kinds of mushrooms and some beef stock, you can whip this up fairly quickly. Like my post about home made gnocchi, these tartlets do require a specific kitchen implement – i.e. mini muffin pans. They provide the perfect mold for the bite sized treats. Begin by dicing the mushrooms very fine. I use a food processor for this as it provides the paste-like consistency I prefer, however if you have decent knife skills you can simply dice the fungi down until you achieve nearly the same fineness. Set the mushrooms aside and melt the butter in a large sauce pan over low heat. Once it has melted add your flour to make your roux, whisking it steadily to ensure that a) there are no lumps and b) you don’t scorch it. Add the beef broth, whisking steadily until it starts to thicken. Add the mushrooms and the thyme. Due to the high water content of the mushrooms, your broth will re-liquify pretty quickly. Turn the heat up to medium-low and cook off the water until you get a pudding like consistency. Add salt and pepper to taste. This is now ready to go into your pastry cups. Using your favorite pie dough recipe – such as the one found here. Roll out the dough until it is fairly thin – thinner than you would use in a regular pie. I would guess we’re talking about 1/8 to 1/16 of an inch, but this is completely made up. In order to fill the mini-muffin cups, you need a 1 1/2 or 2 inch biscuit cutter or a similarly sized glass. Cut out rounds of pie crust with your selected tool and gently mold them into the mini-muffin tin. You can grease the mini muffin pans if you’d like, but due to the nature of pie crust (i.e. it’s high fat content) you probably won’t need to. It never hurts though, right? 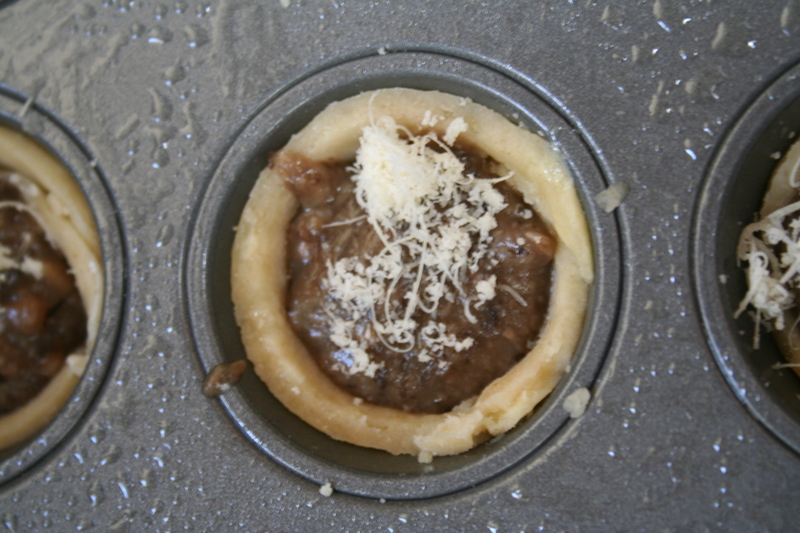 Fill the cups with the mushrooms and then sprinkle a small amount of freshly grated parmesan cheese on each one. Bake at 325 degrees for about 20 minutes, or until the pastry starts to brown.